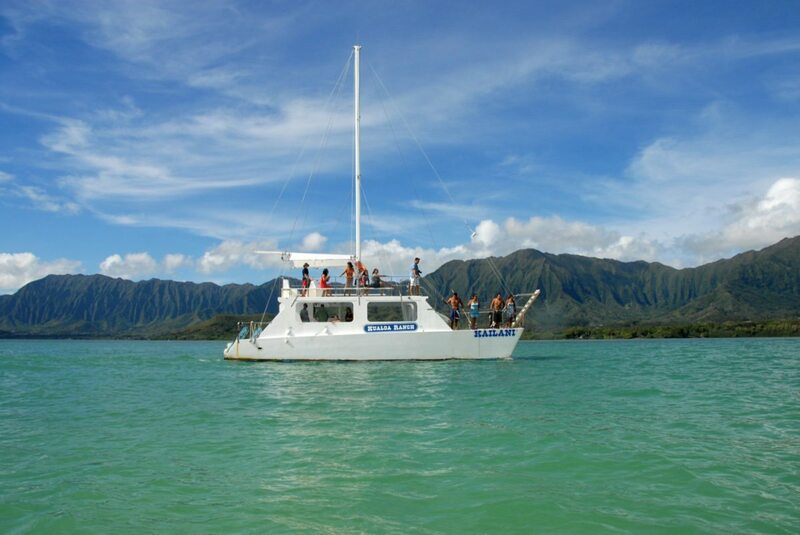 Enjoy a catamaran tour of Oahu’s beautiful windward side and the blue waters of Kaneohe Bay. Depart off of Moli’i dock over to Secret Island where you will board our private 49-passenger catamaran for a tour out on the bay. See the famous and iconic Mokoli’i Island (Chinaman’s Hat) and Hokule’a Beach – the ceremonial home of Hawaii’s Hokule’a double hulled canoe. If you’re lucky you may also see turtles feeding depending on the time of day. The tour also offers spectacular views of Hakipu’u, Kualoa and the Ko’olau mountains and the sacred Kanehoalani mountain peak. In ancient Hawaiʻi, when Hawaiian canoes sailed past Kanehoalani, they lowered their sails out of respect, as it, and Kualoa, were considered the most sacred part of the island of Oʻahu. TIP 1 : Don’t forget your camera and some sun screen! TIP 2 : Advanced reservations are recommended as many tours sell out 2-3 weeks in advance. Kualoa prides itself on providing the best guest experience, so our “guide-to-guest” ratios are very low, with one guide to every six or ten guests in most cases (except for the Hollywood Movie Sites Tour). This contributes to very limited availability, so please accept our apologies if the tour you want is not available. You can also search for single seats as they will usually be available on tours at the last minute if you are willing to split up. This tour does not operate on Sundays and Federal Holidays due to Hawaiʻi State Law. Put the Kool in Kualoa We did the jungle tour and the catamaran ride. Both provided excellent views for photo taking. If you want to see some great movie sets, scenery and history, go to Kualoa Ranch. It was great. A lot to choose from The ranch has a lot of activities to choose from. We did the secret beach, horse back riding tour, movie site tour, garden tour and catamaran tour. All of them are great. Amazing Experience!! Kualoa Ranch has to be one of the most amazing places on earth! Yes, the prices may look intimidating when looking at activities. However, you’ll find that you easily get your monies worth. The catamaran tour provides breathtaking views and seems to be accessible for just about all ages. Kualoa Ranch is a most beautiful piece of this planet. Wonderful scenery & back country trips. We did the 2 hour ATV tour in the Kualoa valley while at the Kualoa Ranch. This brings you back into one of the most beautiful areas of this planet. This is where many movies have been made & there are parts of the movie sets still remaining. Took the air conditioned, VIP movie tour with George as our guide. The tour is two+ hours and is full of information about Kualoa Ranch, Hawaiian culture, and filming done at the ranch. I knew we would see movie and TV items but didn’t know I would learn what an Ahupua’a is (go on the tour and find out for yourself). Kinda cool. The views on the tour are incredible. The are many opportunities to get out of the van to take pictures of the vistas and movie sites and props. In fact, this is the only tour that lets you get out at some of the sites. George was very knowledgeable about the films/TV shows shot at the ranch. Jurassic Park, Jurassic World, Snatched, George of the Jungle, Tears of the Sun, Kong Skull Island, Godzilla, 50 First Dates, Windtalkers, Lost, Hawaii 5-0, etc. We were able to see sites and props from each as well as hear about filming and how it was done. There was never a time where I was bored or not interested in what was going on. I have been to Oahu many, many times and have never done this tour. What a mistake. I must say that on this latest trip to the island this tour was, by far, my favorite activity. Well done, George, and Kualoa Ranch!